The (MS)2 program was founded in 1977 to address the compelling need to cultivate the mathematical and scientific abilities of economically disadvantaged African American, Latino, and Native American high school students from targeted cities and communities across the United States. 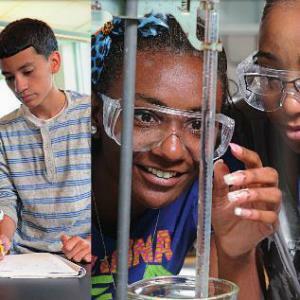 In a residential setting on the historic Phillips Academy campus, the three-summer program challenges students intellectually and exposes them to peers and educators with diverse backgrounds, life experiences, and aspirations. This competitive and rigorous program is free of charge for all students selected. Competition for admission is keen. (MS)² is designed to work in tandem with the public school systems in an effort to better prepare students of color for future careers in the mathematic and the scientific fields. Candidates for admission must complete a pre-application form and return it by the deadline date. To be eligible for admission, a candidate must currently be in the 9th grade in a public school, must have completed one full year of algebra by June 2013, and must be a US citizen or legal resident. In addition, the applicant must match and fit the needs of the program and vice versa. Admission will be based, in part, on the candidate’s academic achievement to date, demonstration of a strong interest in science and mathematics, teacher recommendations, personal desire and motivation, and demonstrated financial need. The program accepts applications from African-American and Latino/a students from public schools in Atlanta, GA.; Baltimore, MD. ; Boston, MA. ; Chicago, lL. ; Cleveland, OH; Fort Worth, TX; Lawrence, MA. ; Louisville, KY.; Memphis, TN. ; New York, N.Y.; and Washington, D.C. Native-American students may apply from any geographic area of the United States and must meet all other program criteria. Finalists among the applicants will be given personal interviews. The (MS)² scholars attend Phillips Academy for three consecutive tuition-free summers. No student should refrain from applying to (MS)² because of inability to pay for additional costs. The generosity of the supporting corporations and foundations covers the cost (over $15,000 per student). All scholars receive full room and board, as well as textbooks and course materials, free of charge. The only possible costs to the scholars are those of incidental expenditures for the five weeks.